Did you know that luxury REALTORS will pay $400 for elevated photos of a luxury home or a neighborhood? Commercial real estate firms need elevated shots of malls and businesses. RealTourVision, Obeo or CirclePix don't offer elevated or aerial photo tours. You can compete against them by offering services to REALTORS that they don't offer. Our elevated tour rigs are made right here in the USA of aircraft grade aluminum and come in both wireless and cable release models. 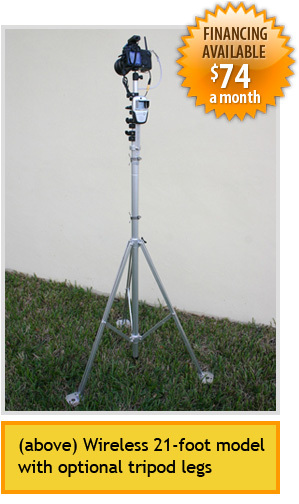 Having fun and making a lot of money can be yours when you add an elevated photography rig. We offer a wireless and cable release model designed to work with most Digital SLR cameras. Nikon, Sony and Canon area ideal choices. To select the wireless model with live preview, make sure your camera supports a video out port. Use the wireless doo-hickie (included) and attach it to your camera's video "out" port and your hot shoe. Now you can take photos from heights up to 21 feet up. 21 Foot Model. Cable Release, Tripod Legs, Nikon D5000 Camera with 18mm - 55mm lens & Storm Military Grade Carry case. Or finance it for $74 a month*. Same Day Financing Available. Click Here to Apply. Written by Frank Robertson Jr. I cannot understand how some of the local photographers can afford to stay in business by offering cheap tours at $70 a house. All I know is I can run circles around the CirclePix photographers now as I offer my clients the chance to enjoy elevated tours and photos from a birds eye view. True as advertised, the system was easy to learn and I couldn't be any happier charging $200 for a combo 360 tour with (1) elevated photo of the home or neighborhood. You guys rock. Thanks for coming with cool new stuff that puts more money in our pockets.